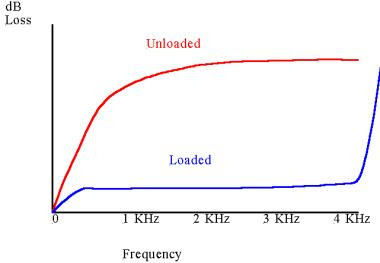 Early in the development of the telephone system infrastructure designers realized our everyday speech lies in between 125 Hz and 8 KHz with most voice centered between 400 and 600 Hz. With more studies designers realized that humans can recognize and interpret voice if they stayed within this frequency range. 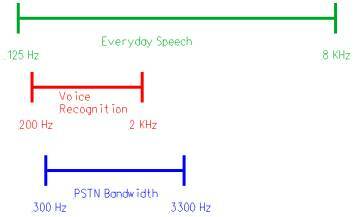 Voice frequencies below 200 Hz and above 2 KHz play very little role in voice recognition. Since the early 1900’s the infrastructure has been tuned to match these frequency requirements using devices called loading coils. Both George Campbell at AT&T and Michael Pupin at Columbia University were working in 1899 on wire pair mutual capacitance problem. Both realized that, by adding a lump series inductance called a loading coil, resonance could be used to cancel the effects of shunt capacitive reactance and increase signal strength over long local loops. Michael Pupin ended up getting the patent and by late 1899 loading coils were being installed in the field on copper wire pairs longer than 3 miles. Loading coils are a simple lump series inductance that produce an effect called loading. Loading increases the series inductance of the loop and effectively makes the loop a low pass filter, increasing the impedance of the line which drops signal attenuation. 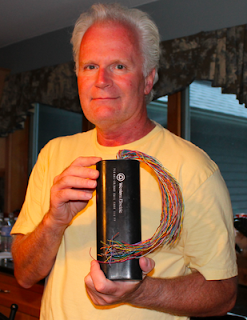 A typical 26 gauge local loop pair is loaded with a 26H88 loading coil. The letter H designates a coil that is added every 6000 feet, 26 represents 26 gauge wire and 88 indicates the inductance of the coil is 88 mH. This loading makes the loop perform as a low pass filter and cuts the frequency off sharply at around 3.4KHz. Loading coils work great for the low bandwidth requirements of voice but causes problems when you want to transmit data at higher bandwidths over these same wires. Calculate the cutoff frequency and sketch the frequency response curve for a local 3 mile loop using 26H88 loading coils spaced every 6000 feet. Notice using this formula total loop distance is not used in the calculation – only distance between coils is required. In addition to H (6000 ft) load coil spacing, there are also B (3000 ft) spacing and D (4500 ft) spacing loading coils. By changing coil spacing along with coil inductance the loop cutoff frequency can be adjusted or tuned to the proper value. Let's look at another example. 22mH loading coils are spaced every 3000 ft on a local loop. Calculate the cutoff frequency. Loading coils have been used over the last 100 years and are an excellent way to tune a local loop to voice frequencies between 300 and 3300 Hz. As carriers move to provide high bandwidth data services such as ADSL on the same local loop being used for voice the low pass filter characteristics of the loaded local loop provide significant bandwidth limitations. We can see frequencies above 4000 Hz on loaded loops are blocked. For this reason loading coils are being removed from the local loop.